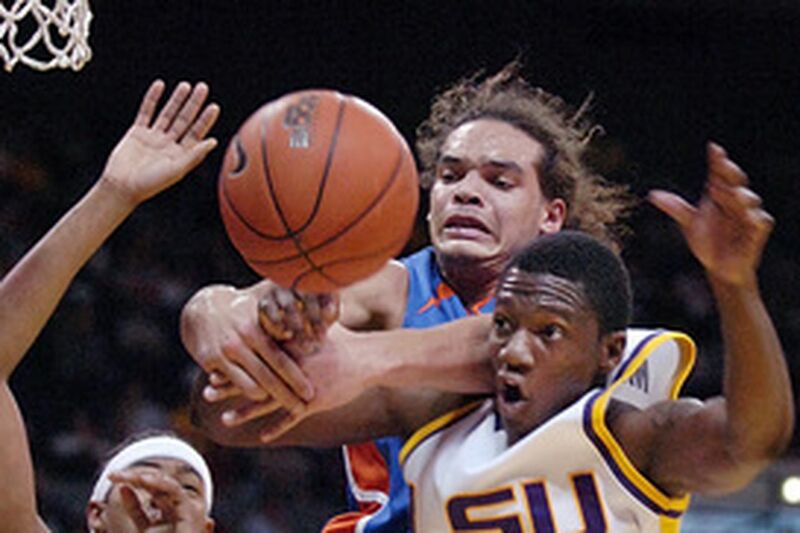 Florida's Joakim Noah and LSU's Dameon Mason (right) battle furiously for control of a rebound in the first half in Baton Rouge, La. Louisiana State had lost three straight and nine of 10 before the win. Terry Martin scored 18 points and Garrett Temple added 17 to help struggling LSU upset No. 3 Florida, 66-56, yesterday in Baton Rouge, La. Tasmin Mitchell scored 11 for Louisiana State (15-13, 4-10 Southeastern Conference), which had lost three straight and nine of 10 before hosting a team that had been No. 1 little more than a week ago. Florida (25-4, 12-2), which had already wrapped up the SEC regular-season title and had set a school record for single-season victories, had little riding on the game and played like it. Texas Christian 71, Air Force 66 - The Horned Frogs (11-15, 3-11 Mountain West) shot 75 percent in the second half against No. 14 Air Force (23-6, 10-5) in Fort Worth, Texas. Notre Dame 85, Marquette 73 - Luke Harangody scored 22 points to lead Notre Dame (22-6, 10-5 Big East) over No. 16 Marquette (22-8, 9-6) in South Bend, Ind. San Diego State 86, BYU 74 - Brandon Heath scored 30 points to lead San Diego State (20-8, 9-5) to a home victory over Mountain West Conference leader No. 21 Brigham Young (21-7, 11-3). Auburn 86, Alabama 77 - Quan Prowell and Korvotney Barber each had 17 points to lead Auburn (16-14, 6-8 SEC) over No. 25 Alabama (19-9, 6-8) in Tuscaloosa, Ala.
UCLA 75, Stanford 61 - The No. 4 Bruins (25-3, 14-2 Pac-10) closed out their first undefeated home season in 32 years with a win over Stanford (17-10, 9-7). Kansas 89, Iowa State 52 - Mario Chalmers scored 18 points to lead six Kansas players in double figures, and the sixth-ranked Jayhawks (25-4, 12-2 Big Twelve) routed Iowa State (14-14, 5-9) in Lawrence, Kan.
Texas A&M 97, Baylor 87 - Acie Law scored a season-high 31 points, and the No. 8 Aggies (24-4, 12-2 Big Twelve), playing in College Station, Texas, beat the Bears (13-14, 3-11) for the sixth straight time. Washington State 58, Oregon State 54 - Mac Hopson's jumper with 35.5 seconds to go put No. 9 Washington State (23-5, 12-4 Pac-10) ahead for good against Oregon State (11-19, 3-14) in Corvallis, Ore.
Nevada 95, Boise State 81 - Senior forward Nick Fazekas scored 28 points and grabbed eight rebounds to lead No. 11 Nevada (26-2, 13-1 Western Athletic Conference) over Boise State (16-11, 8-6) in Boise, Idaho. Southern Illinois 76, Evansville 69 - Randal Falker scored a career-high 30 points, leading No. 13 Southern Illinois (25-5, 15-3 Missouri Valley) over Evansville (14-16, 6-12) in Carbondale, Ill.
Butler 56, Detroit 36 - Brandon Crone scored 17 points, and No. 15 Butler (26-5, 13-3) clinched a share of the Horizon League championship by beating Detroit (11-18, 6-10) in Indianapolis. Texas 68, Oklahoma 58 - Kevin Durant matched his career high with five three-pointers and scored 32 points to lead No. 19 Texas (21-7, 11-3 Big Twelve) to a win over Oklahoma (15-12, 6-8) in Norman, Okla.
Virginia 75, Georgia Tech 69 - J.R. Reynolds scored 25 points and Tunji Soroye had a key put-back as No. 24 Virginia (19-8, 10-4 Atlantic Coast Conference) beat Georgia Tech (18-10, 6-8) in Charlottesville, Va.
Syracuse 71, Providence 67 - Andy Rautins scored 19 points and Demetris Nichols hit a key three-pointer in the final minute as visiting Syracuse (20-8, 9-5 Big East) beat Providence (17-10, 7-7). Virginia Tech 73, Miami 57 - Zabian Dowdell scored 20 points and four of his teammates were in double figures as Virginia Tech (20-8, 10-4 ACC) defeated Miami (11-17, 4-10) in Blacksburg, Va.
Texas Tech 59, Oklahoma State 57 - Jarrius Jackson hit two free throws with 14.2 seconds remaining to lift Texas Tech (18-11, 7-7 Big Twelve) over Oklahoma State (19-9, 5-8) in Lubbock, Texas. Bucknell 54, Army 49 - Abe Badmus hit a three-pointer with 52 seconds left as Bucknell (20-8, 13-1) beat Army (14-15, 4-10) in West Point, N.Y., and clinched at least a share of the Patriot League title. Boston College 59, Clemson 54 - Jared Dudley had 23 points and 11 rebounds and Sean Marshall scored 18 to help Boston College (19-9, 10-5 ACC) beat Clemson (19-9, 5-9) at home. Georgia 86, Mississippi State 73 - Georgia (17-10, 8-6 SEC) scored 10 straight points midway through the second half after Mississippi State (16-11, 7-7) crept within seven points to survive with a win in Athens, Ga.
Tennessee 83, Arkansas 72 - Chris Lofton scored 31 points, and Tennessee (20-9, 8-6) held on for its first SEC road win of the season, over Arkansas (16-12, 5-9) in Fayetteville, Ark. Nebraska 82, Missouri 77 - Aleks Maric hit five of six free throws in the last 47 seconds to lead Nebraska (16-11, 5-8 Big Twelve) in OT over Missouri (17-10, 6-8) in Lincoln, Neb. Utah Valley State 77, N.J. Tech 47 - Ryan Toolson came off the bench to score 17 points as Utah Valley State (21-7) rolled past New Jersey Tech (5-21) in Newark, N.J.
Illinois 68, Penn State 50 - Shaun Pruitt scored 20 points as the wide-body front line of the Illini (21-9, 9-6 Big Ten) dominated Penn State (10-17, 1-13) in State College, Pa.
Kansas State 87, Colorado 71 - David Hoskins scored 21 in the Wildcats' (20-9, 9-5 Big Twelve) win over the Buffaloes (6-18, 2-12) in Boulder, Colo.
Fordham 71, Rhode Island 62 - Marcus Stout had 24 points to lift Fordham (15-11, 8-6 Atlantic Ten) over Rhode Island (17-12, 10-5) in Kingston, R.I.
Creighton 71, Wichita State 54 - Dane Watts hit five of Creighton's nine three-pointers in the win by the Bluejays (19-10, 13-5 Missouri Valley Conference) over Wichita State (17-13, 8-10) in Omaha, Neb. South Carolina 76, Mississippi 63 - Tre Kelley poured in 28 points as South Carolina (14-13, 4-10 SEC) beat Mississippi (18-10, 7-7) in Columbia, S.C.
St. Francis, Pa. 72, Long Island U. 56 - Cale Nelson scored 19 points to lead St. Francis, Pa. (7-21, 4-13 Northeast Conference) over Long Island University (10-18, 6-11) in Loretto, Pa.
Southern Cal 84, California 66 - Taj Gibson had 18 points and five assists and Lodrick Stewart became USC's all-time three-point shooting leader as the Trojans (21-8, 11-5 Pac-10) defeated California (14-14, 6-10) in Los Angeles. Seton Hall 89, South Florida 76 - Brian Laing scored 21 points as Seton Hall (13-14, 4-10 Big East) beat South Florida (12-16, 3-11) in East Rutherford, N.J.
Michigan State 66, Indiana 58 - Raymar Morgan matched a career high with 18 points as Michigan State (21-8, 8-6 Big Ten) rallied past Indiana (18-9, 8-6) in East Lansing, Mich.
Essian Ford nailed a three-pointer at the buzzer to cap a rally from a 13-point deficit in the Commonwealth Conference championship game in Huntingdon, Pa., and send the Profs (14-12) to the NCAA Division III tournament for the second straight year. Dominican 51, Philadelphia University 36 - Jason Hickenbottom had 16 points, but the Rams (19-8) fell to the Chargers (13-14) in Orangeburg, N.Y.
University of the Sciences 83, Felician 73 - Eric Cangelosi scored 23 points as the Devils topped the Falcons (12-15) in Lodi, N.J.
St. Joseph's 89, Lincoln 80 - Despite 19 points and 11 rebounds from Tyreek Byard, Lincoln (18-8) lost in the Association of Division III Independents Northeast Region championship game for the second time in three years, falling to the Monks (20-7) on their home court in Standish, Maine. Millersville 90, West Chester 81 - Shawn Werdt scored 20 points, but the Golden Rams (13-14) fell to the host Marauders (23-4) in the Eastern Division. Holy Family 91, Bloomfield 88 - The Tigers (19-8) rallied from 10 points down in the final 66 seconds to force overtime and won in the extra period at Bloomfield (11-17). Haverford 70, Ursinus 69 - Matthew Palmer hit a three-pointer with 0.5 seconds left in overtime to propel the Fords (14-11) past the Bears (16-10) in a Centennial Conference semifinal in Baltimore.